Summary: Celeste lives in Unity – a town that believes in the Movement. Girls are expected to be faithful, helpful and obedient. Men are expected to marry multiple wives, including girls as young as 15. Contact with the outside world is frowned upon, and friendships between girls and guys the same age, even within the community, are strongly discouraged. 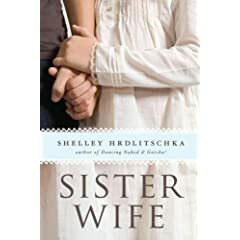 Her sister Nanette cannot wait to become a ‘sister wife’ and marry a much-older man, but Celeste, who is about to turn 15, isn’t sure. Through her relationships with Jon – a boy her age who also has his doubts about the Movement, Taviana – a girl who has moved to Unity to escape her abusive past, and Craig – an outsider who encourages her to think for herself, Celeste comes to realize that there might be more to life than Unity and the Movement. Can she break free from the traditions of her community, or will she become a sister wife? The answers will surprise you in this fast-paced, unique story. Who will like this book: Readers interested in religious outsiders or the polygamous communities that have been in the news lately. This is a good book about what happens when religious faith and individual goals and desires collide. If you like this, try this: The Patron Saint of Butterflies by Cecilia Galante. Mature readers interested in learning about polygamy should check out Escape by Carolyn Jessop or Under the Banner of Heaven by Jon Krakauer. This entry was posted in Realistic Fiction and tagged drama, emotional, problems, religion, sisters, twisted. Bookmark the permalink. Thanks for spilling the ending. You ruined the book for me. @ aggiegoddess: We are SO sorry that happened…that comment slipped by us – we never should have approved it! We have removed it so no one else gets hit with a spoiler. Again – we are super sorry about that!